Get an automatically inflating life jacket and a sailing safety harness in one sailor-friendly PFD! This award-winning life jacket is Mustang Survival's top-of-the-line inflatable PFD with HIT (Hydrostatic Inflator Technology) and an integrated sailing harness. Designed for serious sailors to use in severe weather with exclusive technology that enhances safety and minimizes maintenance. It features the exclusive USCG-approved Hydrostatic Inflator Technology, bright fluorescent yellow-green inflation cell, lightweight outer shell fabric used in the body armor industry and a zippered pocket. You'll hardly notice you have it on, but wearing it will definitely improve your chances of survival if you end up in the water. Hydrostatic technology offers reliable inflation even in severe conditions! Mustang Survival's HIT Inflatable Life Jacket features the Hammar 1F auto inflator which uses hydrostatic pressure to automatically inflate only when submerged in 4" of more of water. That means it won't prematurely inflate due to rain, spray or humidity. The inflation cylinder is also located inside the bladder to protect it from corrosion. A backup oral inflation tube ensures your safety. The patented SecureZip™ closure system breaks open easily when inflated, is easy to repack and stays closed during rigorous activities or high winds. Rearm with Mustang Survival's Rearming Kit (sold separately). The integrated sailing safety harness exceeds Offshore Racing Congress (ORC) standards and includes double stainless steel D-rings for attaching to your safety tether (sold separately). Having an integrated harness makes it easier to wear than having a separate PFD and harness that don't always work well together. 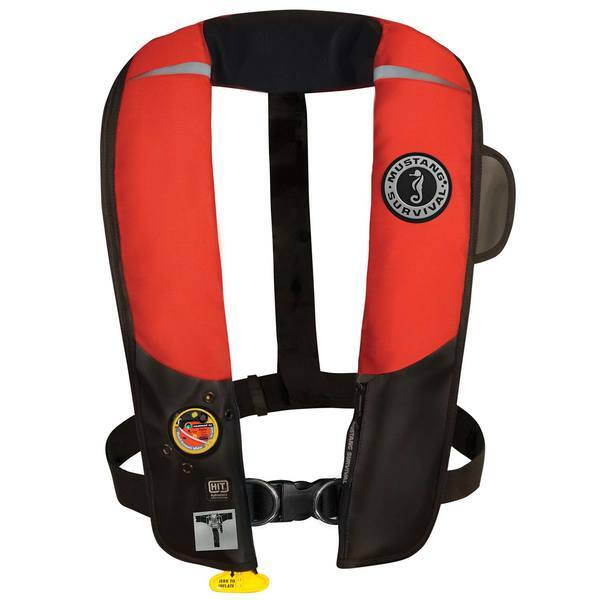 This lightweight, comfortable PFD is designed with a low profile for maximum mobility. That last thing you need when you're scrambling across the deck to roll up the jib in a squall is a bulky life jacket that inhibits your movements. Its soft neoprene Comfort Collar™ won't chafe your neck so you can wear it all day and all night, whether you wear it over a rash guard or your foul weather gear. The lightweight outer shell fabric is the same fabric used in the body armor industry so it will stand up to years of harsh conditions. A small zippered pocket, strobe light attachment, reflective shoulder accents and a safety whistle are also included. The bladder is bright, fluorescent yellow-green and includes SOLAS reflective tape to aid others in spotting you should you end up overboard. Research shows fluorescent yellow-green to be the most visible color in a water rescue scenario.